All week long many of us sit at our desk hacking away at the keyboard writing stories, preparing proposals and pointlessly checking e-mail, Twitter and Facebook. Other than the occasional bathroom break we are sedentary. At the end of the day without the proper mental motivation we're tempted to talk ourselves out of exercising because we're exhausted and there is always tomorrow. Friday arrives and the 5-day routine that keeps us focused on work and away from the junk food cabinet disappear. Friends, family, sit-down dinners a few chips here and there, a glass of wine turns into three or four and before you know it your bowflex is being used to dry the kids clothes. None of us are getting any younger so how do we fix this? Luckily I have a wife who's as competitive as I am. Happily I have a few friends, who, with a little push want to be healthy. Job number one is to find someone you can count on. Someone that will push you as you push back. That someone can be five people, it can be ten. It's as simple as texting someone the day before. "Let's meet at the school tomorrow at 8. We're running 5 miles". If friend number one says no way, you're crazy, go down the list and find one or two people that are willing to join you. It's so important to balance hard work with exercise. It's a great stress reliever. It's a great way to refresh your body and your mind. If you are in good health, there is really no excuse. If you are too busy, read Tim Ferris 4-Hour Work Week. It's a life changer. At 45, my wife Kim and I have taken an extreme liking to adventure races. 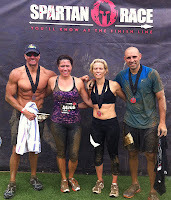 We competed in the first Muddy Buddy in Orlando for fun. After that, we wanted to win. Who doesn't? These types of races have become the latest craze all over the country. You can compete as an individual and they have team categories. Some are all running with obstacles. Some include a mountain bike. Chances are there's some type of adventure race in whatever city you live in. The idea is to get more people in your circle involved. Because when fitness is fun, everyone can enjoy staying healthy. Then, that beer or glass of wine at the end of the week doesn't cost you so much. In between the races, you have to train. But the races provide you with a goal, the motivation to train. If you are competitive you are going to want to win. To win, you have to train. And as the headline to this piece states, Saturday's Were Created For Extreme Fitness. Here's our workout for Saturday, May 14th. At 8AM I went for a 6-mile run with Angel Ruano who take my FitCamp class. My wife went to the school to run sprints. The only way to improve your 5K and longer distance runs is to run sprints. She went her way, we went our way. After the run we went up to the pool. As Kim biked 4 miles, I swam laps. When she returned from the bike, she got in the pool and I biked 4 miles. This we did twice. And we finished the morning workout up with 6 more miles on the mountain bike. Fitness is mostly mental. You are either going to exercise or you are not. You can buy a bowflex or a fancy heart rate monitor or a gym membership or read Jillian's books. The bottom line is if you don't have the mental strength to exercise you'll be wasting your money. If you are a healthy uninjured person there is no excuse. You'd be amazed at how motivating it is to have a few workout buddy's. If you commit to meeting someone, the last thing you want to do is let them down. In turn that motivates you to make it happen. Be a good judge of your body. If your body is telling you to stop, STOP. If you sense an injury, do not try to train through it. On the flip side, if you feel good, push yourself. Nobody says you have to be a Navy Seal but Navy Seal's are a classic example of how much you CAN put the human body through. You have to have goals in life. One of our goals is to train for something. Obstacle course racing has become an addiction for many of us. They are fun and promote the spirit of teamwork. They also breathe life into your workout, which can get boring over time. Check out some of the races we love to run. All the links are above.